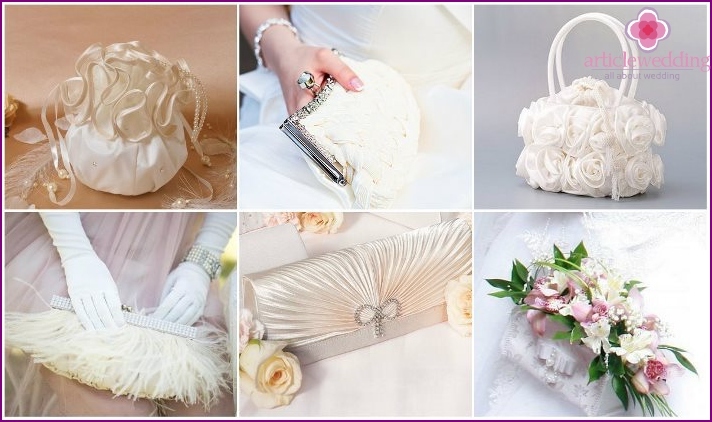 Bride Handbag - sophisticated accessorythe necessity of which is still being discussed at the wedding forums. This is the only item on the wedding, which has the same number of fans, and many opponents. Assurances that the bridal handbags are inconvenient, it would seem, have a logical explanation: the bride's hands are busy bunch, and to carry the necessary things like phone, powder and handkerchief girlfriends. However, we show that the practicality of this cute little things successfully competes with imaginary inconvenience, and her beauty and sophistication perfectly emphasize the image of the bride. Although the function of any bag - store your stuffmistress, the main criterion for the selection of this part is not so much the size of the wedding (which is traditionally very small), but the appearance (shape, color, decor). Wedding handbag should fit harmoniously into the image of the bride, it does not interfere during the marriage in the registry office, at a photo shoot, and other festivities. Therefore it is necessary to think in advance whether the bride is comfortable to wear at a wedding or a clutch bag with a strap preferable. Not to be mistaken with the size, you need ahead of timedetermine what to take with him to the wedding, and what to pay for storage girlfriends or female relatives. As a rule, things like powder, lipstick, tissue / handkerchief and the bride puts phone in her purse, and more bulky items (perfume, additional cosmetics, a spare pair of stockings / tights, drugs) is a witness. Before buying ask the seller to lay down the selected items in the vending handbag - so you will know what size you need. 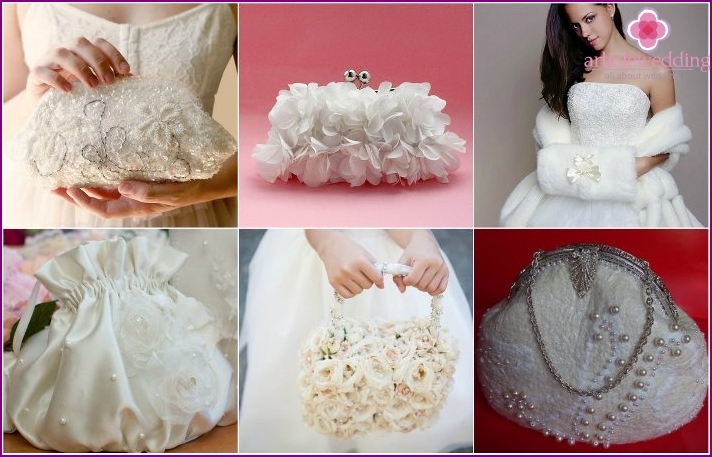 Modern bridal boutiques offer hundredsdifferent bags for brides. The urgency and relevance of this accessory makes designers to work on his models as well as on wedding dresses. 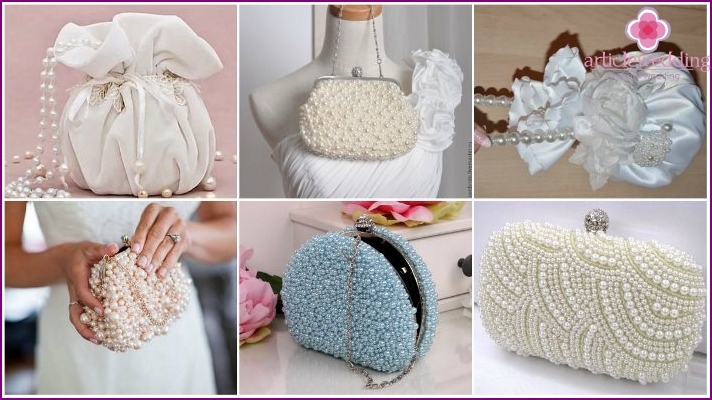 A variety of styles and shapes, colors, materials and decor make it possible to pick up her purse to almost any wedding dress. Successfully selected handbag or clutch will add individuality to the typical dress salon, will be the highlight of which is gracefully set off the image of the bride. What are the models of handbags in the trend today? 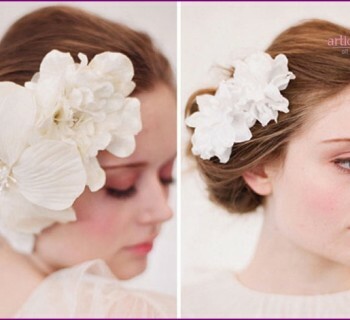 This species, called "pompadour"ideal to dress with a fluffy skirt (style "Princess"). The pouch is considered one of the most comfortable models, as It has straps so you can wear it on his hand, even in the absence of the handle, and on the wrist and the elbow looks equally harmoniously. Pompadour - a single model that is worn on the belt, which is very convenient from a practical point of view. 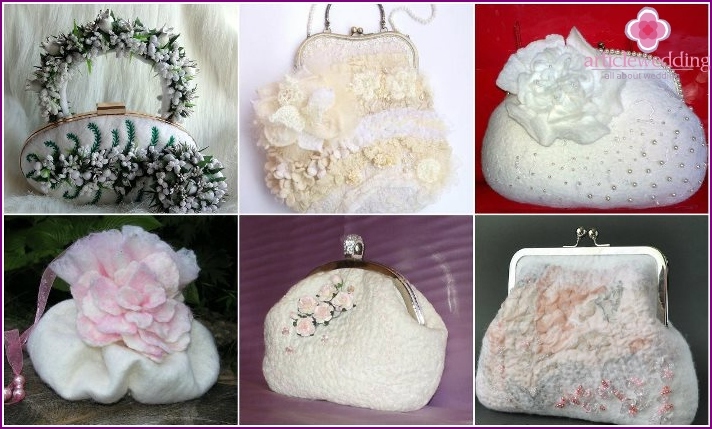 Handbag-bag universal and externally: the use of tissue for this style has no limits - well look like satin and brocade bags, and lace or crocheted. This is a very romantic model that is perfectIt fits into the classical European wedding. Heart-shaped do tend clutches or covers, so this type of bag will come to pay by direct or fitted silhouette, including in the Greek style. 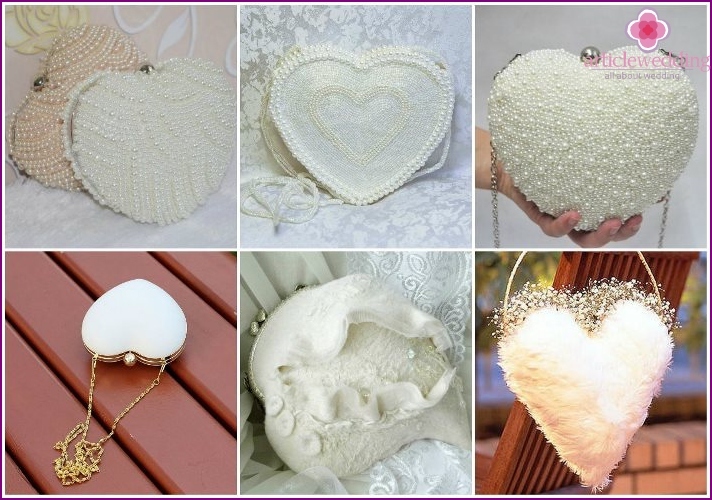 Heart-clutch often entirely decorated with pearls or sequins. So wedding dress for this accessory should be concise, smooth out with a minimum of fabrics and decorations. This kind of bag-bag. The difference is that a shapeless bag, pouch also has a pronounced elongated rectangular shape, which is maintained even under strong tightening. In addition, the pouch ribbon positioned close to the edge (with a slight indentation or edging seam). And the classic drawstring pouch can be located both at the edge and away from the edge (sometimes in the middle of a handbag - in this case, tightened edges create the effect of a blossoming flower). Pouch of lace or precious fabrics (satin,velvet, moire, brocade) suitable to the dress with crinoline (the image of "princess"). Gobelin, milled or beaded bag - to direct a style (or close fitting A-line). Bag-pouch of sequins, beads or rhinestones with fringe along the bottom edge - a great addition to the short and long straight dresses 20-ies of the last century (eg, for a wedding in the style Gatsby). Actual clutch in recent years - this is the perfectaccessory for cocktail dresses and long models of direct or A-line. Well, if that bag will have a removable strap for fastening on the wrist, allowing the bride to free his hands, if necessary. Trendy kind of clutch-bag case (especially entirely decorated with stones or crystals) suitable for any modern way in a laconic style, including a complex silhouette of "mermaid" who is very picky about the accessories. This accessory is appropriate not only in winter but also inwarm season. Modern-clutch handbag Taschenmuff made of fur fabric lining, felt or thick multilayer materials (satin, velvet). Functionalities such detail adds a small inner pocket, usually with a zipper and chain or tesemochka, so if you want to hang around the neck collar, giving the bride to freedom of movement. Modern wedding decorate Taschenmuffall kinds of ornaments, lace, live or artificial flowers. Clutch suitable dress is the model of "Princess" or a retro image. For a more contemporary styles, choose Taschenmuff, decorated with real fresh flower buds or leaves. 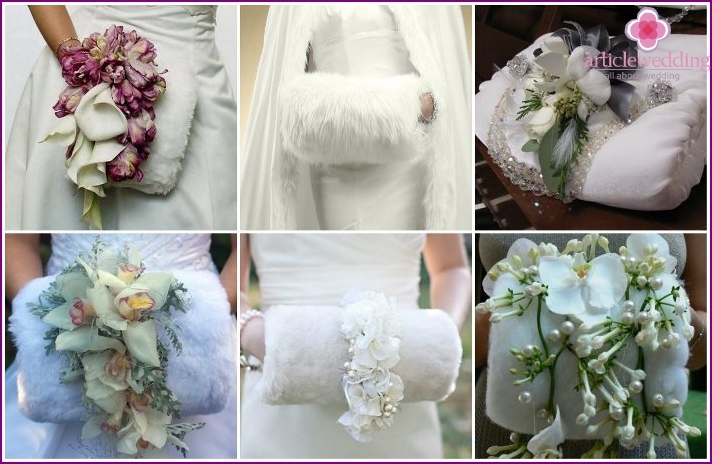 For a winter wedding the perfect alternative to fur clutch becomes felted Taschenmuff with embroidery. 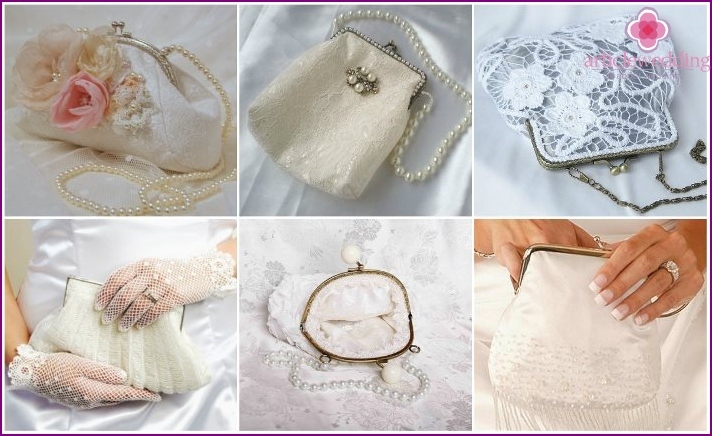 Model handbags with clasp (a special type offasteners) echoes the vintage style and is perfect for a wedding "Princess" model is not very full skirt, retro styles and dresses with lace. Do not combine this bag with the Greek dress, the latter is more appropriate clutch. Either choose an image for the Empire model with a rectangular clasp maximum fine workmanship. Style is always important hand made by hisuniqueness and special power - in fact, these things are a great positive message to the owner. Modern felted bags are not only very beautiful, but still rare guests at weddings, because this trend is gaining momentum. As a model, as a rule, choose a bag with a clasp or a clutch. Less fooling pouches or pompadour, but they look a bit too heavy for wedding accessory due to the fact that the felt is much denser than normal tissue, and the assembly forms a thick drawstring clumsy folds. The decorated wedding bags bride? Wedding accessories must not violate the generalstyle holiday plan. For topical script (for example, an ethnic Indian, Gothic or rock and roll wedding) the bride bags decorated individually and decor items often have to purchase on request. Classic wedding in a European style has no limits: in the course are lace, fur, crystals and stones, beads, sequins, beads, embroidery, appliqué and more. Fashion in this issue also exists. The same will be decorated with the most current bridal handbags and clutches in 2016? 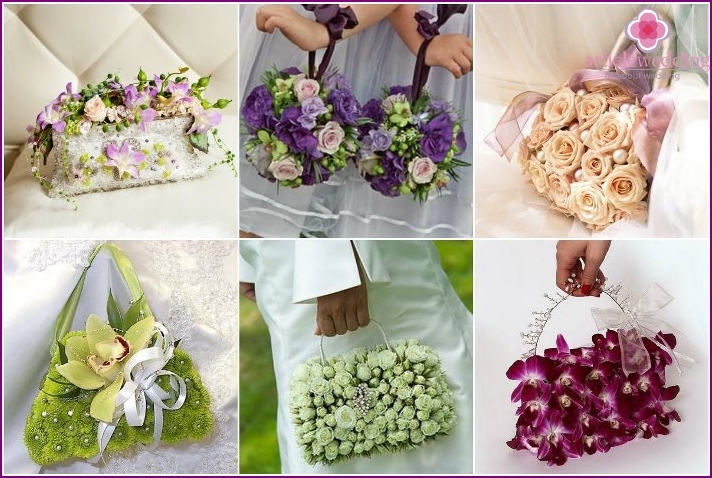 Handbag, stylized bouquet - an incrediblethe creation of designers and florists, a fresh trend in wedding fashion, which will not leave indifferent any girl. It is decorated with fresh buds in whole or in part. The model is usually a clutch-box or bag with a clasp, less coupling with inner pocket. A major shortcoming of handbags decorated with vibrant colors, is its fragility and impracticality: one wrong move can ruin the perfect beauty of delicate buds. This precious marine mineral - symbolinnocence and purity. Therefore, since time immemorial, natural and cultured pearls - a popular wedding decor, loved by many brides. 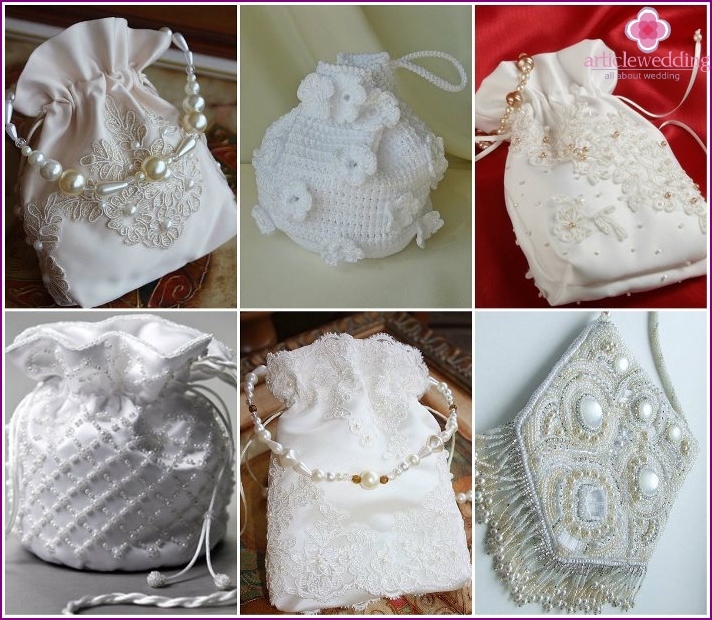 handbags embroidered with pearls look touching and romantic. A pearl-handle ribbon - very stylish detail, especially in models pompadour. 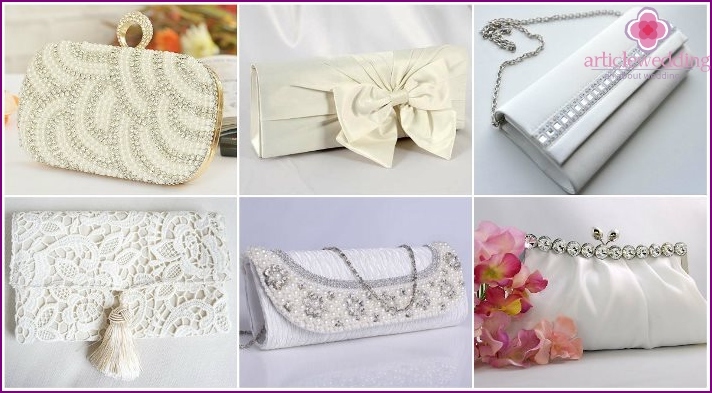 Hollywood glamor in the modern wedding fashion - the whole decorated with pearls clutches, wallets, that will make any girl image luxurious and memorable. Feathers add elegance and lightness, andhandbag with similar decor is elegant and full of gentility. The main rule in such a decoration - restraint. If the design of handbags there are several individual feathers, it is permissible to support them the same finish in a bouquet or hair. 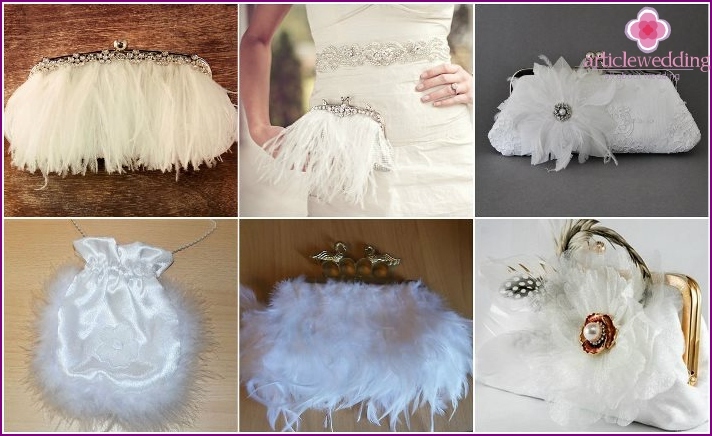 If the bag is decorated with feathers as a whole, let this focus belongs only to her, the rest of the image of the bride jewelry feathers will stylistically bust. Handbag with feathers ideally suited to the fitted silhouette and fabric with a smooth texture. Many women wonder: how risky to choose a handbag for photos and videos on the Internet? Can I buy this thing, not having felt his hands, not an example of the image? The answer is simple: this accessory is not as important as the dress or shoes, so it is quite possible to choose and purchase in the online store. Most virtual boutiques offer a universal model handbags and clutches that are in style, color or finish to suit a lot of dresses. View these bags you can as presented. The exception for remote shopping bagsIt is a complex model dress that requires meticulous selection of components. 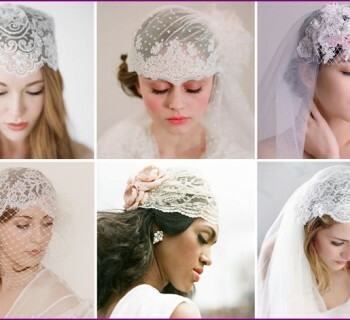 For example, when you need to select these two items with identical texture lace / fabric or in the same color such as ivory, which has many shades. Very expensive and exclusive products made in an unusual style, it is also desirable to acquire after a personal inspection, to not give up and do not regret the money spent. 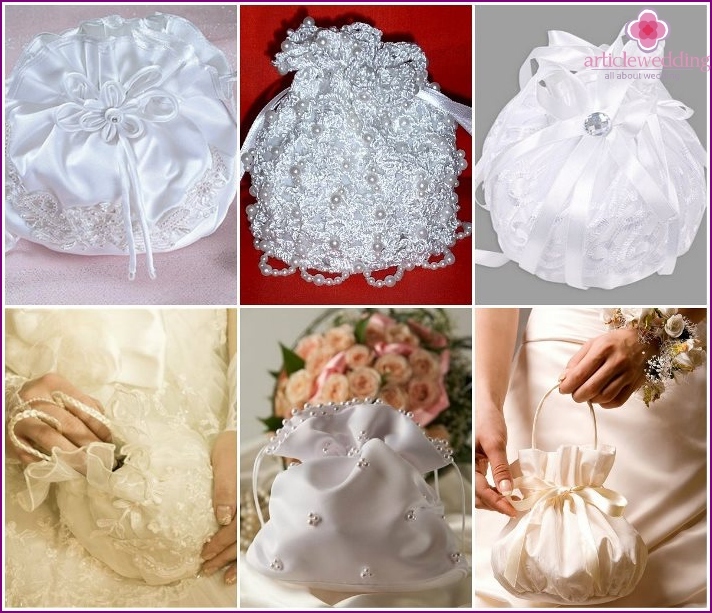 The wedding fashion 2016 handbags for bridesoccupy a place of honor along with other accessories. Famous brands offer bags made in the same style with their collections of dresses. If you do not want to pay, then stop your choice on unregistered, but also beautiful models that are sold in almost every bridal salon at an affordable price. 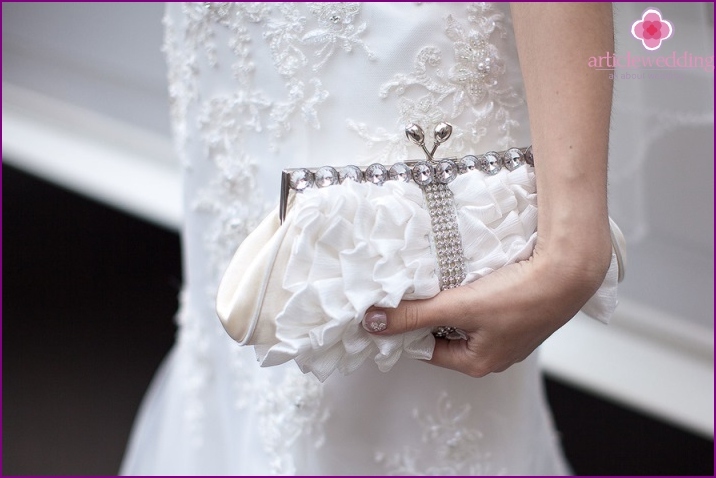 More photos of actual handbags for the bride look in our gallery.